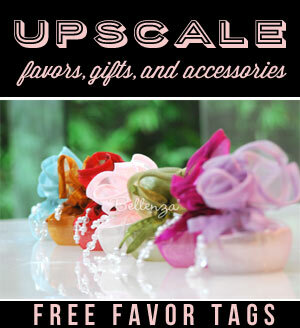 Start by deciding on a color palette that will pull your party look together. Then, use that to guide your choice of decor elements – as we did here with teal/aqua, pink, and purple. 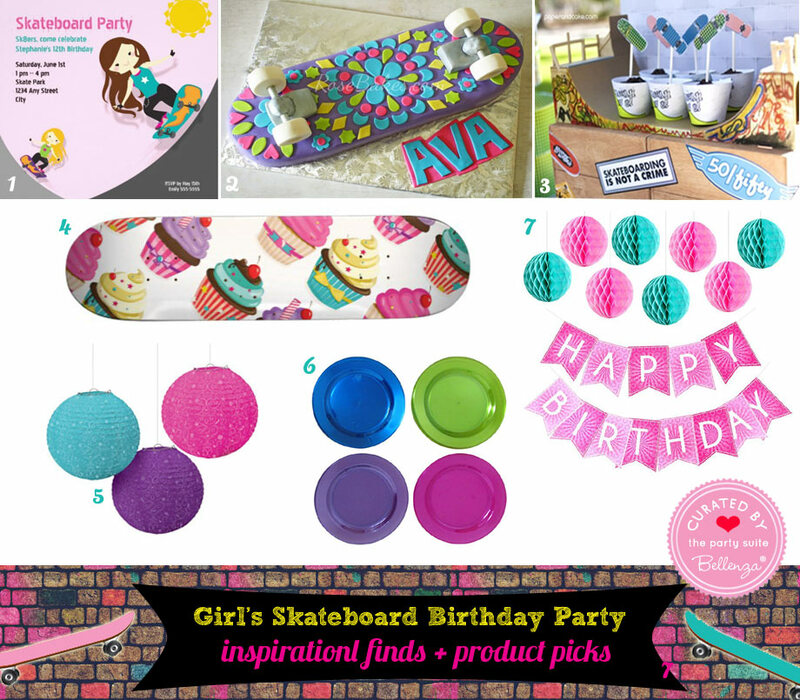 Send out skateboard party invitations (1) from the great selection of cutesy to cool designs available. Match this with an adorable skateboard birthday cake (2) that the birthday girl will just love. 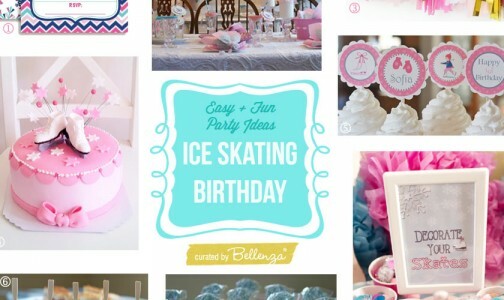 Create imaginative food and dessert displays inspired by the theme, too – treats on a DIY skateboarding ramp (3) or on an actual cupcake-design skateboard (4) that’s also a surprise gift for the celebrant! 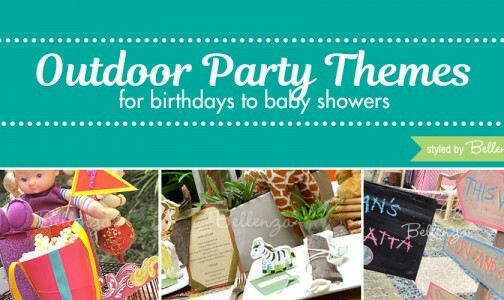 Then, unify the overall party look by continuing the color scheme with festive paper lanterns (5), colored party plates (6), and a fun birthday banner (7). Plan smart! 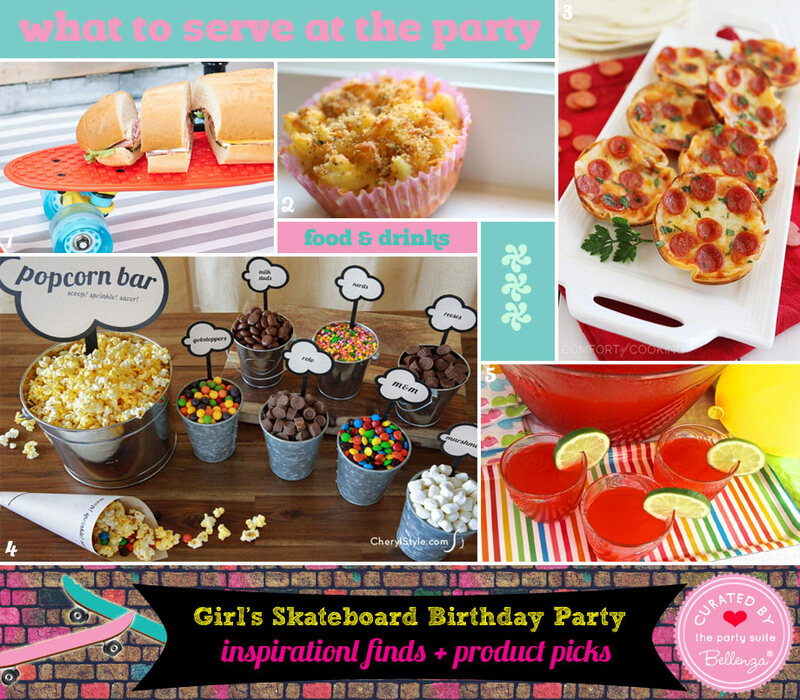 Go for a children’s party menu that features sure food and drink faves that are easy-to-serve, too. Mini Tortilla Pizzas (3), and a DIY popcorn bar (4) with yummy fixin’s from Gobstoppers to Rolos to M&Ms to marshmallows and more! Then, have a big bowl of ice-cold Party Fruit Punch (5) to serve a cupful to each thirsty little guest. 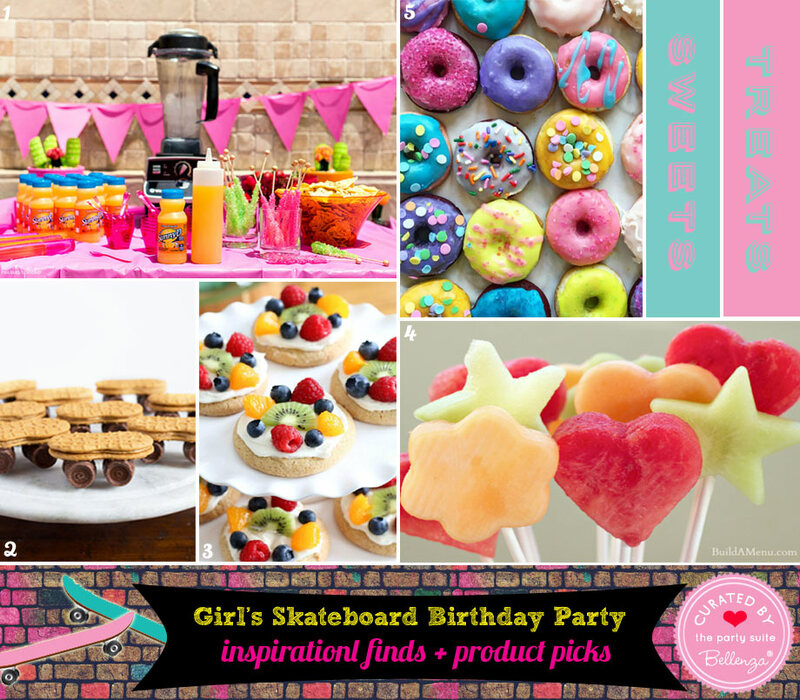 Now, for the sweet treats that are must-haves at any kiddie event. Make it a mix of skateboard-inspired goodies, plus fresh fruity ones. To keep everyone cool, how about a Homemade Snow Cone Station (1) using your blender to make the shaved ice, different flavored syrups in squirt bottles, and brightly colored plastic bowls and spoons for single servings. The kids will be thrilled! Then, for that array of sweets and healthy treats, offer up the cutest Nutter Butter Skateboards with Rolo Wheels (2), bright and colorful Fruit Pizza Cookies (3), fresh Fruit Pops (4) in playful shapes, and Mini Donuts (5) frosted to resemble little-girl “graffiti”! Now, this is where you can go all-out with themed treats – from the favor loot bags to the fillings! Make your own favor bags (1) from colored paper sacks with a skateboard graphic on a sticker. 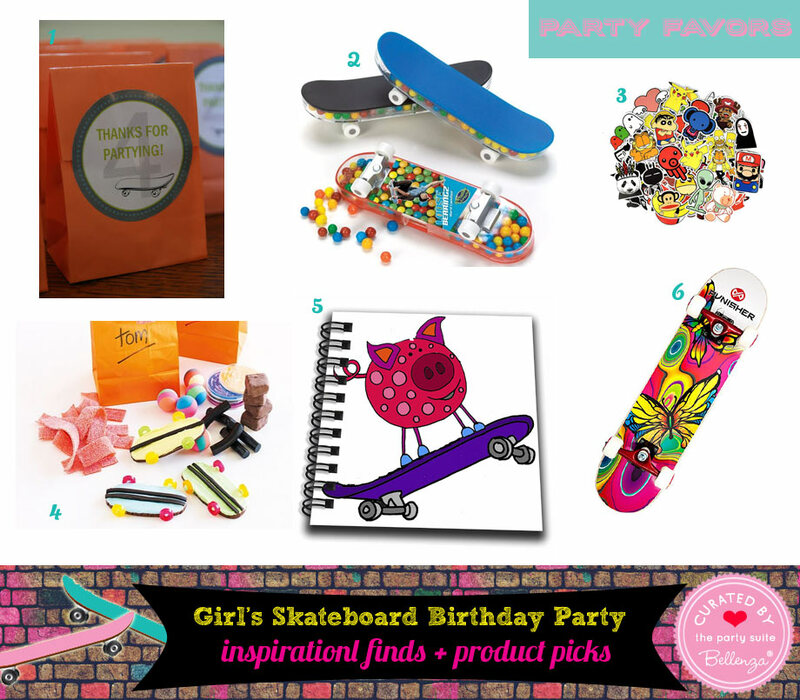 Then, fill them with fun finds like candy-filled toy skateboards (2), a pack of skateboard cookies (3), an adorable “pig on a skateboard” mini notepad (4), and assorted skateboard stickers (5) to decorate their own stuff even after the party. And as a surprise gift for the birthday girl (just like the one in the food display), have an actual full-size skateboard (6) as the centerpiece for the favor table! The obvious party playtime activity would be actual skateboarding out in the yard. But if you are short on space or don’t want to make any non-skateboarding guests feel left out, you can still plan super-fun activities like these. For starters, yes, there is such a thing as a Skateboard Piñata (1)! So, there you have a sure-hit party game (literally). Or consider holding a finger skateboard competition (4) among the young guests. What about “crafty” activities with a skateboarding spin? One could be assembling a LEGO Friends Mia’s Bedroom Building Set (2) that includes a treehouse bed, a skateboard ramp, a walkie talkie, a bunny house, and a Mia mini-doll figure and pet rabbit figure. Another could be to provide the materials for a Decorate Your Own Skateboard (3) project, with the finished boards as take-home keepsakes. 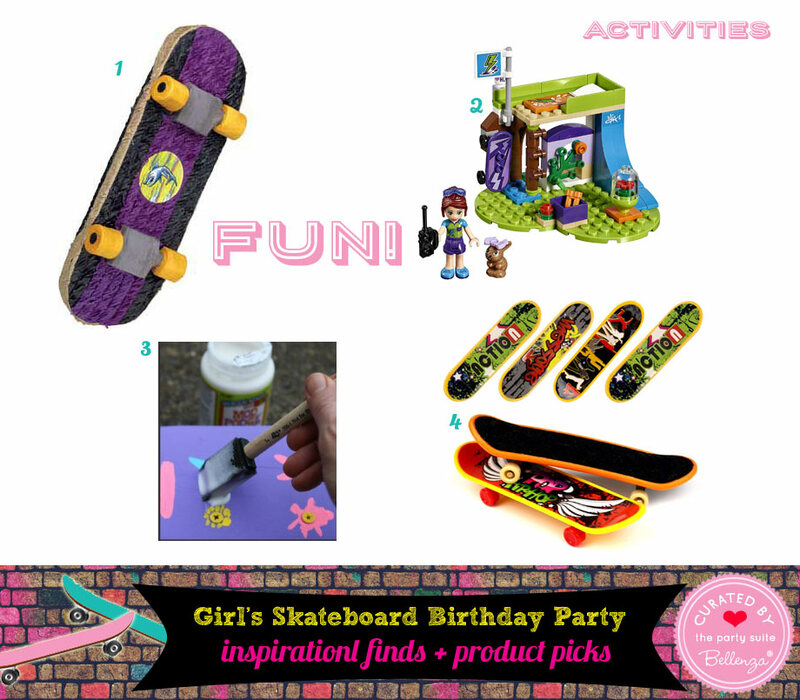 So, who says a skateboarding theme can’t be pulled off for a pre-teen girl’s birthday party? 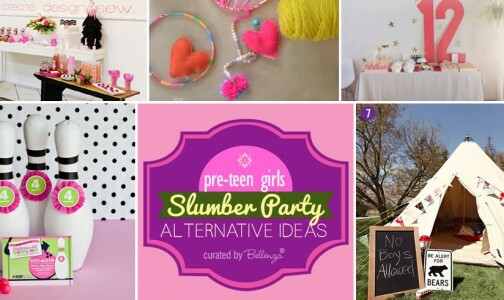 We’ve given you a whole range of rad ideas and inspiration. If you’ve got more of your own, do share them with us!